Time: 21 june 1983, 04:42. 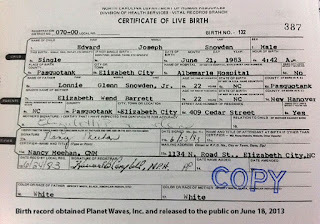 Eric Francis of Planet Waves FM obtained the birth certificate of Edward Snowden, and shared it with the astrological community on june 18th 2013. 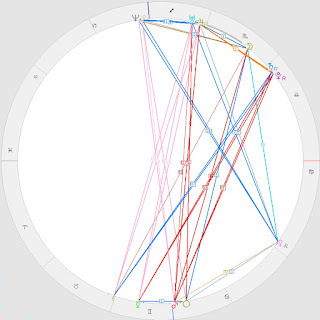 Here's a birth chart analysis by Eric Francis. Before we go on, note that the Dubbhism approach to birth chart analysis is a little different. Theodor Landscheidt’s so-called Golden Aspects are used to calculate relative strengths of the planets (check the methodology here) and we also like to look at the heliocentric picture. In general, the emphasis is on 'the usual aspects', sprinkled with minor planets, asteroids and fixed stars. This suggests a person who is primarily a warrior, not a smooth communicator. If we look at Snowden's communication style in online debates, conferences and so on, he talks like an intelligent, principled civil servant. He has a dry, almost boring tone of voice. He doesn't have the rhetorical talent of a smart politician, but he does have the analytical power of a nerd. Sometimes, we see uncensored expressions of anger and indignation when he talks about compromised ideals, like freedom of information and democracy. There's certainly some trickster stuff going on, but it's also David vs. Goliath. While Snowden may not be a great debater, he does have the balls of a warrior. Not only does his Mars have the most Golden Aspects; all seven of them are of the less stable variety, suggesting a very dynamic Mars. His total number of Golden Aspects is average, suggesting that his overall mental stability is average. The strong Venus may come as a surprise, but keep in mind that Snowden's loyal long time girlfriend, the pole-dancing Lindsay Mills, followed him all the way to Moscow. Sounds like a happy couple. And he earned a very nice salary when working for the NSA. The weak Saturn could mean that authorities and rules don't really impress him, or that he's not really a workaholic. 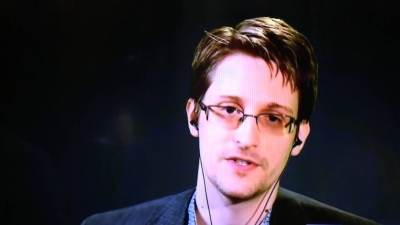 The weak Pluto suggets that on his own, Snowden is not going to trigger a revolution in the world of intelligence and secret services. Lockley's article about whistleblowers and the Galactic Center suggests that in Snowden's birth chart the GC must have some special significance. In fact, it can't be missed: the GC is conjunct Neptune. Using this clue, the Sun/Mars conjunction opposite the Neptune/Galactic Center conjunction becomes the primal focus and essence of the chart. It can be interpreted as follows: fuelled by (naive) idealism, the warrior fights in a secretive way against the forces that are obscuring The Truth, in order to reclaim his powers. Or something pretty close to that. The Galactic Center is also sextiling Pluto (0°10'), suggesting that hidden things will be uprooted. Besides Sun/Mars opposite Neptune/GC, the second 'great opposition' in Snowden's chart is Mercury opposite Uranus/Jupiter. The Uranus-Mercury opposition is often interpreted as symbolizing freedom of information. The Saturn-Pluto conjunction finally, which is trining Sun/Mars and sextiling Neptune/GC, shows a bit of how the warrior fights his battle: an effective organizer with grit and determination, and a secretive control freak. 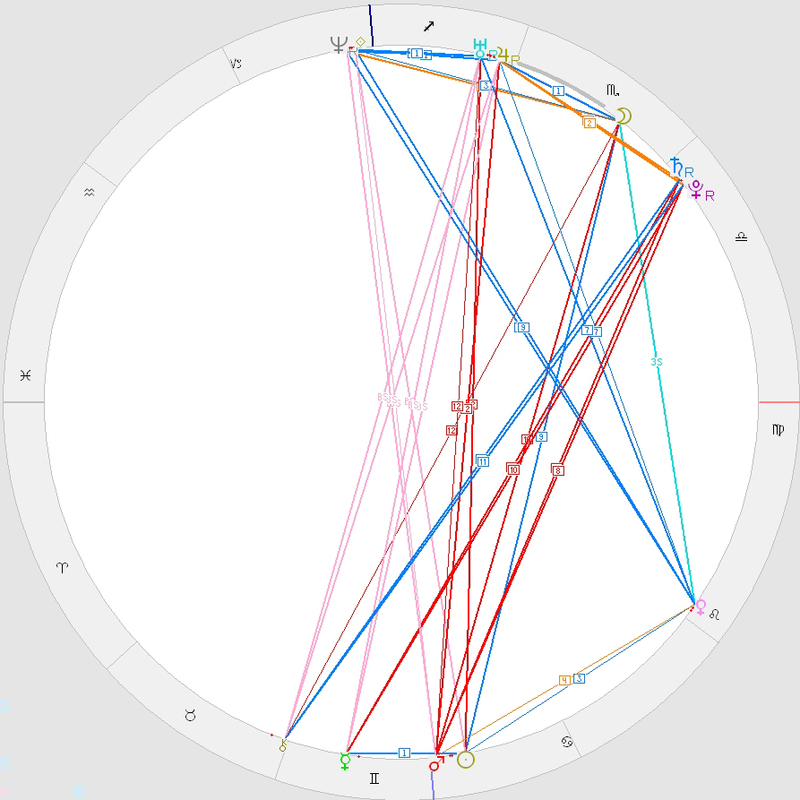 The tightest aspect in the geocentric chart is Saturn sextile Neptune (0°01'). Any astrology textbook will tell you that this aspect is good for people who work in the intelligence business. Moving up to the heliocentric perspective, the tightest aspect now repeats the mercurian theme: Earth squares Mercury. Other tight heliocentric aspects include Earth sextile Pluto and Neptune sextile Pluto; a lot of Pluto power. Jupiter conjunct Uranus also makes sense. Snowden has Aldebaran on geocentric Mercury. Here's what Marina at Darkstar Astrology has to say about this: "These subjects seem to take it upon themselves to speak out against evil. They may swing between sinner and saint and have the archetypical Mercurial talent of switching abruptly between conflicting principles. They may confuse people with their twin personalities, but they also have a talent for being able to build bridges and mediate between opposing forces. They may like to play devils advocate also." Just in case you thought this was boring, here's something a little more SPECTACULAR. According the guy in the video, Edward Snowden is THE THIRD ANTICHRIST! Thanks for warning us sir, nice hat!